Subsidiaries: Grumman Aerospace Corp.; Grumman Allied Industries, Inc.; Grumman Data Systems Corp.
Leroy Grumman and others worked for the Loening Aircraft Engineering Corporation in the 1920s, but when it was bought by Keystone Aircraft Corporation and the operations moved from New York City to Pennsylvania, Grumman and his partners (Edmund Ward Poor, William Schwendler, Jake Swirbul, and Clint Towl) started their own company in an old Cox-Klemin Aircraft Co. factory in Baldwin on Long Island, New York. The company filed as a business on 5 December 1929, and opened its doors on 2 January 1930. Keeping busy by welding aluminum tubing for truck frames, the company eagerly pursued contracts with the US Navy. Grumman designed the first practical floats with a retractable landing gear for the Navy, and this launched Grumman into the aviation market. The first Grumman aircraft was also for the Navy, the Grumman FF-1, a biplane with retractable landing gear. This was followed by a number of other successful designs. During World War II, Grumman became known for its Navy fighter aircraft, F4F Wildcat and F6F Hellcat, and for its torpedo bomber TBF Avenger. 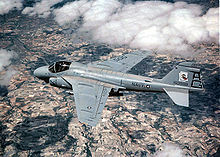 Grumman's first jet plane, the F9F Panther, became operational in 1949, but the company's big postwar successes came in the 1960s with the A-6 Intruder and E-2 Hawkeye and in the 1970s with the F-14 Tomcat. 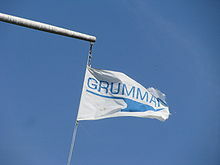 Grumman products were prominent in the movie Top Gun and numerous WW-II naval and Marine Corps aviation movies. Grumman was the chief contractor on the Apollo Lunar Module that landed men on the moon. They received the contract on November 7, 1962, and built 13 lunar modules. As the Apollo program neared its end, Grumman was one of the main competitors for the contract to design and build the Space Shuttle, but lost to Rockwell International. 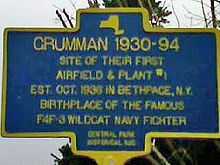 For much of the Cold War period Grumman was the largest corporate employer on Long Island. Grumman's products were considered so reliable and ruggedly built that the company was often referred to as the "Grumman Iron Works". As the company grew, it moved to Valley Stream, New York, then Farmingdale, New York, finally to Bethpage, New York, with the testing and final assembly at the 6,000-acre (24 km) Naval Weapons Station in Calverton, New York, all located on Long Island. At its peak in 1986 it employed 23,000 people on Long Island and occupied 6,000,000 square feet (560,000 m) in structures on 105 acres (0.42 km) it leased from the U.S. Navy in Bethpage. The end of the Cold War, at the beginning of the 1990s, the reduced need for defense spending led to a wave of mergers as aerospace companies shrank in number; in 1994 Northrop bought Grumman for $2.1 billion to form Northrop Grumman, after Northrop topped a $1.9 billion offer from Martin Marietta. Picture - The Battle Management and Engagement Systems Division is the only remaining Grumman related business left in the massive Grumman complex in Bethpage. The new company closed almost all of its facilities on Long Island with the Bethpage plant being converted to a residential and office complex (with its headquarters at 1111 Stewart Avenue becoming the corporate headquarters for Cablevision) and the Calverton plant being turned into an airport that is being developed by Riverhead (town), New York. 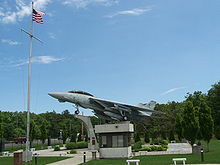 A portion of the airport property has been used for the Grumman Memorial Park. The company still occupies several buildings within the Bethpage campus and employs around 2,000 people. Grumman Olson built aluminum truck bodies, known as stepvans. Under the Grumman-Olson brand it made the P-600 and P-6800 step vans for UPS. Grumman also manufactured fire engines under the name Firecat. Grumman Pictures and Grumman for Sale.